If you’re a government agency that owns vehicles, chances are the Benton County shop worked on those vehicles at some point. 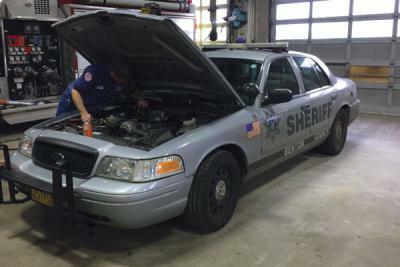 The Benton County Motor Pool and Shop performs fleet maintenance for 42 accounts in Benton County. In addition to maintenance, they manage most of the fleets. This means that they keep track of what and when those fleets need maintenance, and reach out to the account liaisons to schedule service appointments. They used to keep track of all the accounts by hand and a paper calendar, but utilization of a software system beginning in 2010 has made management logistics smoother. The very first fleet management collaboration began with the Alsea School District in the early 90s. The superintendent at the time asked the county to take on the maintenance and management of five school buses. School buses are on the same chassis as trucks, so the team agreed to take on the project. “The shop is non-profit, so the county benefit is solely offsetting overhead costs. Back then, there was a drive and willingness to help out,” said Jim Burke, longtime Benton County Fleet Manager. The next account to come on board was the City of Corvallis Parks Department. The county shop started to gain a reputation for efficient service and the in-house shops couldn’t compete with the county’s turnaround times. Over time, in-house shops realized they couldn’t afford to keep a single mechanic busy and there was major cost-saving by allowing the county to manage the fleet. Once word got around Corvallis about the county shop’s reputation, the Corvallis Fire Department came on board. Once the Corvallis Fire Department joined, the other regional fire houses followed suit. Now the Benton County shop manages the fleets for the Albany, Corvallis, Tangent and Lebanon Fire Departments. “Once the Fire Departments started talking, the reputation of our level of service really skyrocketed,” said Burke. Actually, it’s become difficult for Burke and his crew to maintain this level of service. Over time industry certifications have become more specialized, and changes in the inspection process has made it more difficult to keep the timely, high-quality service regional partners expect. Dave MacKenzie, foreman in the county shop, said, “County mechanics were learning how to maintain lawn mowers, graders, fire trucks, school buses and other vehicles. Jim wanted to recognize them for the extra work they put in as the industry become more specialized. The Benton County shop was the first government agency in the Pacific Northwest to receive the Automotive Service Excellence Blue Seal of Excellence. The Blue Seal of Excellence is awarded when all mechanics in a shop have master-level ASE certifications. In addition to ensuring that his staff earn the master-level certification, Burke has integrated this expectation into hiring practices. All mechanics hired will already have the ASE certification, or they will immediately begin preparing for ASE testing upon hire with the goal of earning the master-level certification. Burke will retire after almost thirty-one years of service in June. This collaboration that counts will certainly be a lasting legacy at Benton County. For more information regarding these services, please call the Avery Building reception desk at 541-766-6821. If you commit a crime on forest land in Benton County, there is more than one law enforcement agency that can come down on you. Forest Deputy Schermerhorn with the Benton County Sheriff’s Office (BCSO) and Captain Greg Moore with the United States Forest Service (USFS) can tell you all about the host of regulations, statutes and ordinances that can be enforced. There are 60,000 acres of USFS land inside of Benton County. The USFS has propriety jurisdiction and can enforce federal rules and regulations. Benton County also has local jurisdiction and can enforce local ordinances and state statute. In a lot of places, this could end up as a turf war. In the Willamette Valley, collaboration across law enforcement agencies is key. At least once a month Deputy Schermerhorn and Captain Moore go out together and look at problems happening in the forest. “We go out and talk about what can be done. The people in our area aren’t exclusively committing forest crimes here. They will move around between places in the area, so you have to talk about what can be done and wisely manage the areas,” said Captain Moore. When there is a problem that needs to be addressed, sometimes the USFS has management regulations they can enforce that a Sheriff’s Deputy could not. This type of communication and innovative problem-solving creates a productive and beneficial collaboration both for local agencies. Additionally, the BCSO and USFS collaborate in other areas like public outreach. The two agencies work together to host an annual Marys Peak cleanup, provide educational outreach during fire season, and even coordinate attending the same trainings to ensure cross-agency consistency. Oregon State University and Benton County were selected by the Responsible Retailing Forum as one of six town-gown communities to pilot an Alcohol Responsibility Program that promotes the responsible sale, service, and consumption of alcohol. With funding from the National Institutes of Health, the model aims to assist alcohol retailers and serving establishments in achieving high levels of responsible retailing conduct. “The Alcohol Responsibility Program is another step in the effort of Corvallis and Oregon State University to address issues of under-age drinking and alcohol abuse in our community,” said Jonathan Stoll, director of Corvallis Community Relations at OSU. The program will be facilitated through the Benton County Partnership, the advisory group to the Benton County Health Department Substance Abuse Prevention Program.